Hockey Plumber: Red Bull Crashed Ice! A friend of mine sent this to my attention. 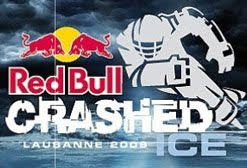 As Red Bull describes it: "Red Bull Crashed Ice is... A combination of hockey, downhill skiing and boardercross..."
In a way, it is hockey without the worry of carrying a stick or having to worry about scoring those elusive goals! The New York Rangers could definitely field a competitive squad!